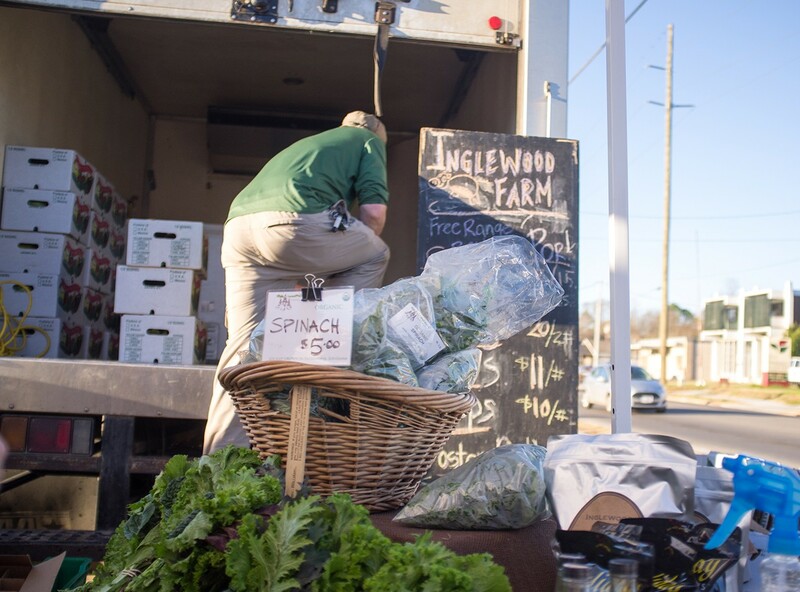 Inglewood Farm is one of several local farms selling products at the Alexandria farmers' market. Situating the region in a larger "foodshed" helps visualize potential markets and opportunities. Up to Grow Good Farm, where this past-season okra has dried on the bush, has room to go and plans to incrementally scale up in the coming years. 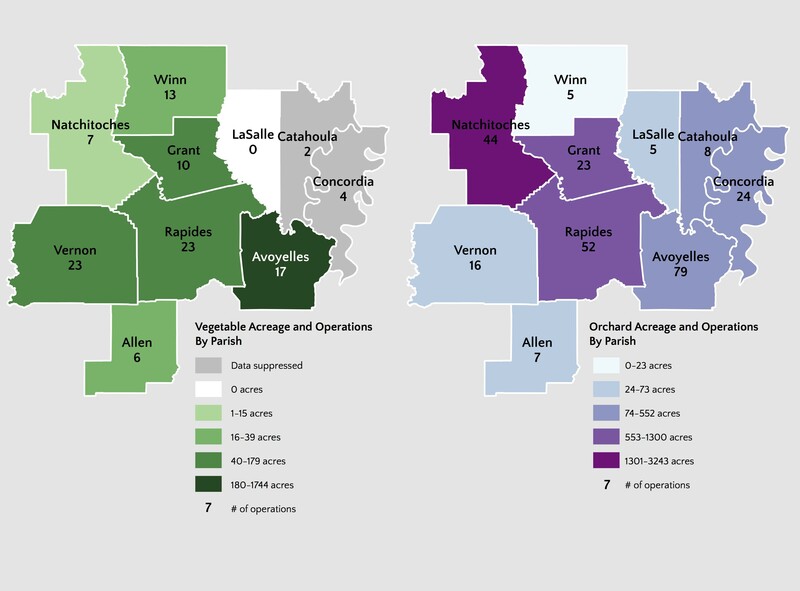 As part of our research, we mapped current production data for the 10-parish study region. Data from USDA Agriculture Census 2012. Aquaculture is an important economic driver for Central Louisiana. 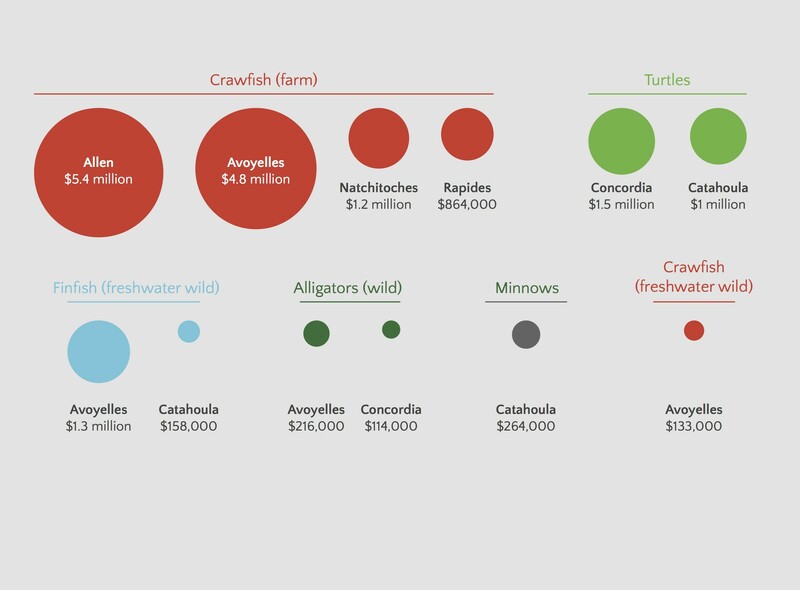 This graphic shows aquaculture sales exceeding $100,000 by parish in 2013. Data from LSU. 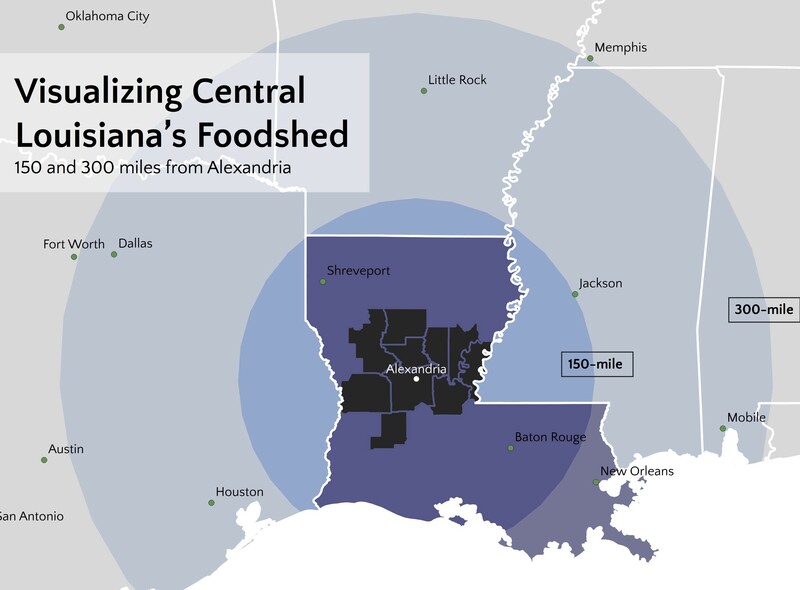 The Central Louisiana Economic Development Alliance had already demonstrated a strong commitment to the potential of local food and agriculture to contribute to economic development and overall community health when they retained Karen Karp & Partners in 2014. They had hired a staff person to lead and coordinate food endeavors, created and facilitated a food policy council, launched a farm-to-school initiative, designed and carried out an annual local food festival, piloted a local food “brand,” and targeted their already successful business acceleration program to farmers. 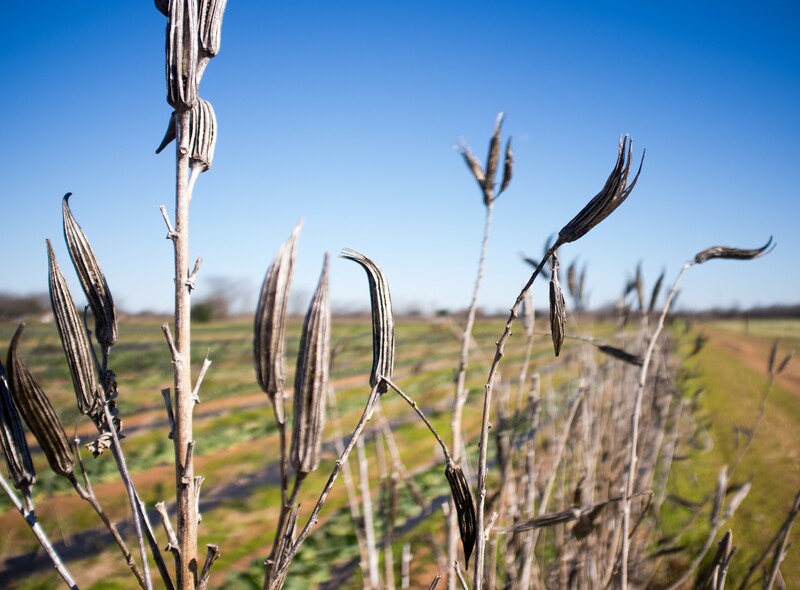 Significant momentum was building behind this local food movement that was emerging in a region where large-scale commodity crop production has long reigned. But CLEDA wanted to know: What’s next? CLEDA had already demonstrated a strong commitment to local foods and agriculture. But they wanted to know: What's next? To identify strategic and appropriate next steps for further developing the region’s food economy, KK&P completed on-site qualitative research to build a deep understanding of the supply and demand sides of the region’s economy, conducting dozens of interviews with area farmers, food business owners, market managers, and other area stakeholders. We also explored existing data and literature, and then combined the qualitative and quantitative research into a synthesized summary of the region’s key food assets and opportunities that addressed the infrastructure, culture and needs of this specific community’s farmers, buyers, and consumers. KK&P recommended a three-pronged approach: network and leverage infrastructure, develop demand, and support farms and farmers. KK&P recommended three complementary strategies: networking and leveraging infrastructure, developing demand for local foods in the region, and supporting increased food production. In each of these strategic areas, we identified specific activities, as well as the partnerships, infrastructures, and internal organizational capacities CLEDA would need to take the region’s local food to the next level. Once the research was concluded, KK&P’s Good People division supported CLEDA through the recruitment process for a new position, the Farm to Table Coordinator, whose responsibilities include making lasting, mutually beneficial market matches between farmers and commercial buyers and enacting many of our report’s recommendations.